We'll post the latest news about the disaster as well as updates on our activities and our supporters as we get updates. Hiro Nishiuchi, a Japanese triathlete contacted us with this update on life within Japan, how his family have been affected. Thank you for your activity. My dad and all my family who lives in Minami Soma city in Fukushima are fine. However, the current evacuation area is within 20km from the Fukushima nuclear plant but our family's house is in 23km from it. They are still stuck in the house. 8 of our family members and our friends have now moved into my wife's parent's house in Nishinomiya in Hyogoken and became a refugee group. My cousin who lived by the ocean was found dead and her grandmother is still missing. I think she was taken by Tsunami. As well as Kamaishi's disaster, this Minami Soma has also been badly damaged by the Tsunami. Because of the high radiation level, neither the self-defence force (Japanese army) or volunteers can get into this area and there is very little that they can do to find the dead. The food supply and other relief items don't reach this area as this is either a prohibited area or track drivers are refusing to enter because they are too worried about the radiation levels. The city officers have to go to the next city or village to get these food supplies. I am also helping these local people trying to deliver stuff these people and also raising funds. From 1st April, we are starting triathlon School and for this preparation, I am very busy and not sitting down for ages. Our mission is that all of our survivors need to do our best to help Japanese economy, and I will do my best, please help us as well Mike! We're very pleased and grateful to have had 5 race entries to the Thames Turbo race #3 donated by Thames Turbo with the sale of each of these places donated to Tri4Japan. Thank your for your support to all at Thames Turbo. Tri4japan would like to welcome Emilio De Soto to our team, he will head up the American fund raising. Based in San Diego, California, he will be ideally placed to help promote our charity in the United States. Due to his business connections in Japan, Emilio has built up strong bonds with the Japanese nation and like us, felt compelled to do all he could to help. Emilio will be an unpaid volunteer, whose motives are nothing more than to help the Japanese who are continuing to endure unthinkable hardship. "Having raced in Japan several times, it is an easy decision for Neri and I to support Mike and the tri4japan auction to help the people of Japan so recently devastated by the latest of the huge natural disasters. Our hearts go out to the people of Japan". 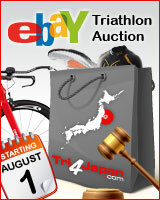 Beginning 1st August, we will launch a massive multi sports auction on Ebay - it will be a celebration of the coming together of triathletes, endurance and multisport athletes as well as competitive manufacturers, all showing that in time of desperate need we can all pull together to help those less fortunate that us with the biggest collection of sports memorabilia of the year! 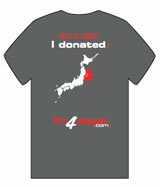 All money raised will go to the Tri4Japan disaster fund, enabling us to effect a change for the better. Many more lots will be added over the coming months. We will announce these on our Facebook page at www.facebook.com/TriforJapan and we encourage everybody to 'like' this page to find out what's going to be auctioned and our fundraising process. Other triathlon wetsuit manufacturers including Orca, 2XU, Speedo and De Soto have also pledged their support. GU Energy, Compress Sport, Bont Cycling shoes and Newton Running have also signed up. It is rumoured that we will have race wheels from Thor Hushovd but it is no rumour that Chrissie Wellington triple Ironman world champion is donating various items of memorabilia. With World Champions such as Tim Don, Helen Jenkins, Ali and Johnnie Brownlee and Richard Stannard all offering their support, we can guarantee to be able to offer a priceless range of goods to auction in August. If there are any pro athletes, celebrities or manufacturers reading this and have anything you can donate, please get in touch with us at info@tri4japan.com and let's make this the biggest and best charity auction this year! We've had further news of Mr Kobayashi from Naoshi Kyomoto, who was the home stay father for Cameron Brown when he stayed in Japan. He is also in charge of Neo Systems, the biggest timing system in Triathlon in Japan and organiser of the National duathlon series in Japan. "Even here in Tokyo it was a terrible earthquake. I could not contact my parents in Sendai for a week. I went to Sendai to see my home last Friday and came back yesterday. It was very hard to get there because there was no highway and no Shinkansen, a journey that takes 11 hours from Tokyo. Fortunately, the house and my parents were safe. My home is inland and therefore unaffected by the tsunami. You already knew the news of Kobayashi-san, he and his wife escaped from the tsunami and are still alive and in a refuge. When I saw the tsunami at Kamaishi on television, I could see Kobayashi-san's house and office being thrown into the tsunami. I talked with Kobayashi-san only the previous day before the earthquake and he was worried about the 2011 race. Kobayashi-san is the organiser of the Kamaishi International Triathlon, but there have been few overseas competitors in recent years. We had talked of the good past races in Kamaishi 10 years ago when triathletes such as Mike, Cam, Glynde ,Jason, Stefan etc. raced. I guess the best thing that you can to do for him is bring athletes back to the Kamaishi International Triathlon and race as age group athletes some day." The aim of Tri4Japan is to raise money to help with the reconstruction of Kamaishi and ease the suffering of the town's people, when that is done we would also like to help bring triathlon back to Kamaishi. Mike Trees, the founder of Tri4Japan, a charity established with the aim of raising funds to help the people of Kamaishi said "For me he has more importance, because when I became a full time pro-triathlete in 1992, he was the first person to invite me to a triathlon. That was when I realized that I could make a living at the sport. He continued to invite me and many of my international friends, until I retired in 2004. We all owe him our gratitude for his support. Last week when I saw downtown Kamaishi, (where he lived and worked), being destroyed in front of my eyes on TV, I was concerned, as the days ticked by and we heard nothing, I feared for the worst." I am attaching the list for refugees at Kamaishi. I confirm from this list that he is at one of the refugee centres. Also, I had contacted his daughter from the thread of people search. I will forward the message once I receive any messages back from her. At least one person sited in the noticeboard saying somebody had spoken to kobayashi san at refugee centre. "I have many fond memories of my time in Kamaishi from racing there in the early 90's as a team member of Team Epson. I was welcomed by Mr Kobaysahi and shown around the area. The Triathlon was just fantastic, we swam in the local bay, rode through the center of Kamaishi and out into the country side then finished the race off with a run along the waterfront. Please help get this wonderful community back together by supporting this Charity." "I just wanted to drop you a note to say I am behind you all the way with tri4japan , I too have had many great experiences racing all over Japan and with out a doubt some have been the high light of my career. I hope the triathlon community comes together to support this worthy cause. Good Luck"
"It is difficult to comprehend the devastation caused by the earthquake and tsunami and how it can overwhelm all aspects of life. The disaster has brought me back to earth and indicated how fortunate my position is in England. I have never raced in Japan though i have heard great things about the support it gives triathlon and would love to experience that in the future. I am committed to help the community of Kamaishi in anyway way I can in order to give back what they have given to the triathlon world."